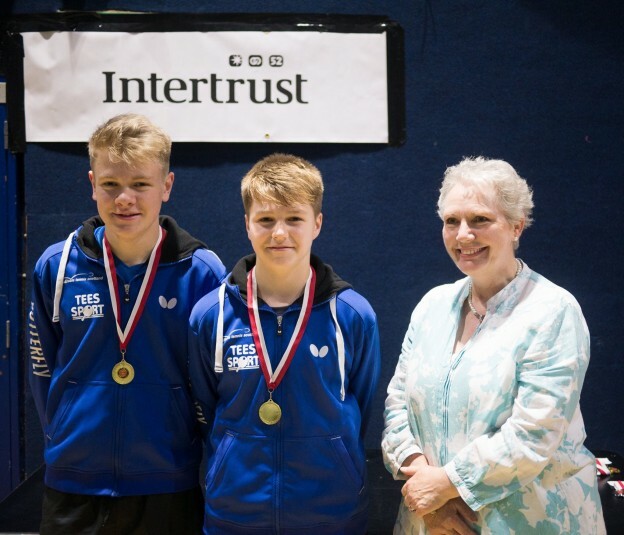 Martin Johnson (Stevenston) from North Ayrshire Table Tennis Club and Harvey McDonald (Ayr) from South Ayrshire Table Tennis Club joined together to form the Scottish A team at the British School Championships in Jersey on 23rd-25th June in the under 14’s event. In the group stages, they were drawn against Ireland A, England B, Jersey, Guernsey and Isle of Man. Martina and Harvey started the competition very well, brushing aside Jersey, Guernsey and Isle of Man 5-0 with relative ease. Then they were up against a very talented Ireland A side, who were one of the favourites for the event due to their strong national development programme. However, Scotland took the first 2 singles and then Martin and Harvey won the crucial doubles match 3-1 to win 3-0. This was a superb win for the Ayrshire boys. Next up were England B. This was a very closely fought match and after 4 tight matches resulting with 2 wins for each team, Harvey won the decider 3-0 to qualify for the semi finals! Here they would play their team mates Scotland B in an all Scotland clash, which they would go on to win 3-0 and gain their spot in the final against England A – the strong favourites for the event. First match on was Martin against England no.2, with Martin playing some of his highest level of table tennis to date winning 3-0. Harvey then lost to the English no.1, but Scotland bounced back well winning the pivotal doubles match 3-1 to take the lead in the overall match score 2-1. Martin then lost to the strong England no.1, to make the match level with one deciding match to go. Harvey, playing some incredible table tennis against the English no.2, won the match 3-0 in spectacular fashion to win Scotland the gold medal – an amazing achievement for the Ayrshire boys. The boys coach at the event, Richard Main, who also works closely with the boys at North Ayrshire Table Tennis Club on a weekly basis, reports “This is an unbelievable achievement for the lads. To win such a prestigious event competing against Britain’s elite players is highly rewarding and is a result of Martin Harvey’s dedication and commitment to the sport”. In the singles event on the Sunday, Martin also reached the semi finals, losing to eventual winner and England no.1 Joshua Weatherby. He collected a deserved bronze medal for the singles to add to the gold medal in the team event. Martin’s attention will now be on the European Championships in Portugal in 3 weeks time where he will be representing Scotland in the under 15’s event. This entry was posted in Latest News on 30th June 2017 by Chris Main.